The answer is NO. The wireless access card that come with default Thinkpad Edge E520 configuration can NOT work in 5GHZ bandwidth range. Note: do NOT go with Intel Centrino Ultimate-N unless your laptop supports 3 antenas (e.g. has three antena wires to connect). The Ultimate-N has 3 antennas. As per Personal Systems Reference Lenovo® ThinkPad ® Edge Series and SL Series Notebooks (June 2011) here is the default Wireless card configuration that come with E520 notebooks. Intel’s value 802.11b/g/n Wi-Fi product for home and business. The Intel® Centrino® Wireless-N 1000 single band (2.4 GHz) 1x2 adapter delivers up to 300 Mbps¹ receive bandwidth, extended range, and unique Intel-only features, such as Intel® Wireless Display, to enhance today’s mobile lifestyle. In the same time, Intel very vividly advertizes the 5GHZ support for its other cards Advanced-N and Ultimate-N types. I have Lenovo ThinkPad Edge E520 with "1x1 1b/g/n Wireless LAN PCI Express Half Mini Card Adapter"
I live in large apartment building where 2.4GHZ broadband around me is packed. To stream the movines from my external storage to laptop I purchased NETGEAR RangeMax Dual Band Wireless-N Gigabit Router WNDR3700 with 5 GHZ range support. Obviously enough, the 5GHZ network was not in the list of laptop networks. Then I called Lenovo technical support 800-426-7378 (Case Number 23P8HBK). The technical guy has knocked my shoes off by vigorously defending the idea that my card does support 5GHZ broadband range. Instead, he claimed the problem with my Windows configuration that falls beyond the current warranty support. Thanks for this info. I've been having a problem with my wireless connection that I think might be related to this -- your input would be much appreciated. Basically, if I'm in the same room as the router, I get wireless connection, and it's fine. If I round the corner into the hallway and beyond, I can see the network, but no connectivity. I've done the whole "updating to most current driver" business, as well as everything that Lenovo support told me to do. I reset my router (not that I thought that was the problem, since 2 other laptops in the apartment get a connection no problem, and I also couldn't connect to a network at a coffee shop...) then even uninstalled the ThinkVantage Access Connections just in case it and Windows were fighting over who gets to control my internet connection. Finally, after all this, Lenovo sent me a replacement wireless card (same one) under warranty, so I replaced the card -- no dice. I finally changed my router settings to WPA2 AES, and this has improved the situation *slightly* -- I can now connect, but so extremely slowly that it's useless. Do you think that the fault lies with the card and its inability to tap the 5gHz spectrum? Hi I have an E520 and Netgear DGND 3700 dual band router. Software support is non existant in UK I thought because it is the latest band /n wireless it will support 5g but it does not see the 5G side of my router. The Thinkvantage toolbox software keeps falling over and currently is in the middle of a 6hour backup so I am not sure what card is fitted but I keep seeing Intel wifi technology although switched on is disabled. I set the router up with Netgear smart wizard and a cable. As you may gather wi-fi is not a strong suite. 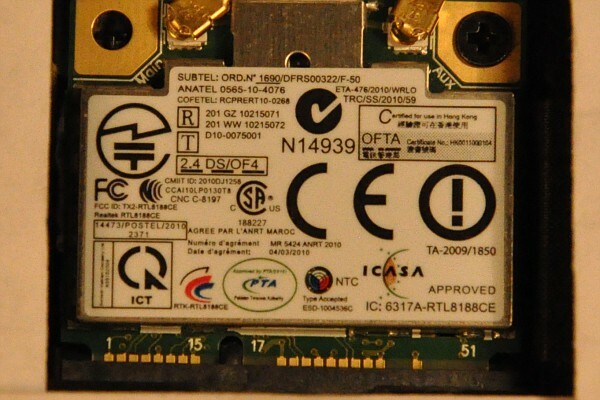 If my card is dual band how is does it find the 5g ssid in the router? I know its set up as I did it . I expected better destructions from IBM but finding info has been vey hard. If anybody finds a way to turn on the 5g signal please post it? Hi again my card I an Intel N-1000 but the spec and the hardware description only says it is a single band 2.4 device.